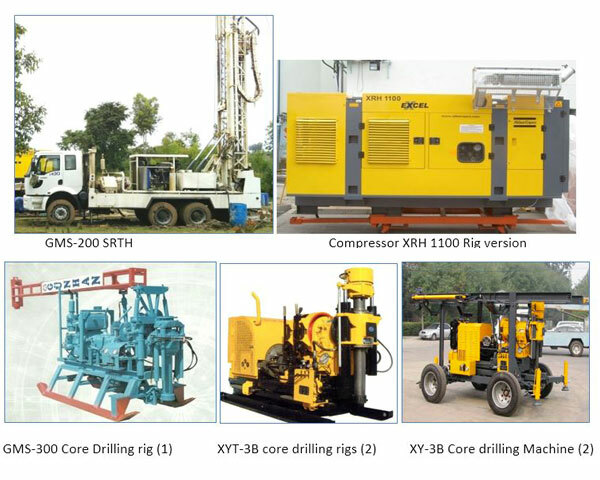 Drilling rig: Rig Type/model is Turkish made GMS-200 SRTH DRILLING RIG. It has a FORD EQUTORQ 300HP engine with heavy duty mast of 17 tons maximum capacity and 10.6m height and could hydraulically rise up. It is equipped with 70cm3 x 2 variable flow hydro motor hydraulic system that is capable of all revolution between 105-50rpm. The rig has 17,000 KN pulling down force and 20,000 KN pull back force capacity. 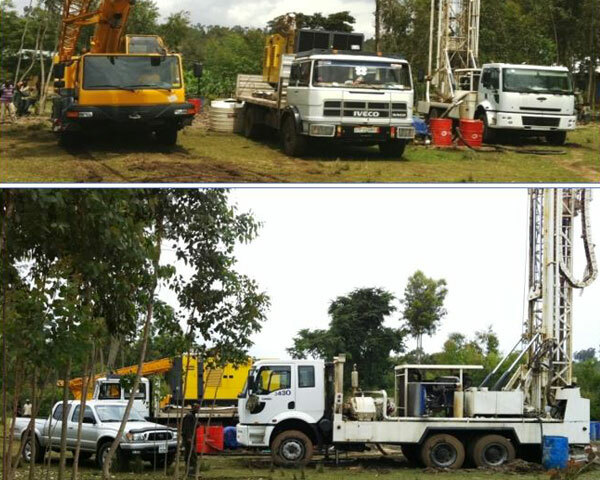 Maximum drilling capacity 300m meters 12 DTH air drilling and 250m with 12 with rotary mud circulation drilling. Its rotary head is power with two hydraulic motor with 158-332 rpm at 9348 Nm first gear and 316-665 rpm at 4674 Nm of having 7.4mk rotary stroke. Moreover, it has also 75 lpm with 30 Bar foam injector pump. Its four hydraulic jacks has 80 cm stroke each and the winch has 8 metric Ton capacity. Compressors: Model/Type is Indian make XRH 1100 Rig Version with 25 Bar maximum effective working pressure, Cummins NTA/855BC Turbo Charged Engine, 519l/s free air delivery and 415 HP maximum shaft speed. Its dimension 3858mm length, 1600mm width and 1865mm height and it has 4300Kg weight. Its capacity of compressor oil system is 67 lit and 37 engine oil sumps. Drill pipes and drill collar: 50 drill pipes each drill pipe weighs 270 Kg and length 6.10m and 4.58 inch diameter. The rigs have 2 drill collars each that weigh 0.8 Ton each, 6.10m length and 4.58 inch diameter. Bits and hammer subs: there are 17”, 15”, 12”, 10” and 8” hard and soft formation with their fitting hammers subs. Mud pumps: There are piston type mud pumps with a capacity of more than 5 inch by 6 inch 720 lpm @ with 50Bar each. Rig carrier truck: one is a 2004 Mercedes and second 2008 Model Ford with both 6×4, 12 speed, 220Km/hr Limited speed; & rated power 3400HP/40rpm. Submersible pumps: 6620 Series Type, single stages, Flow rate 400 m3/h, 60m head, 2900 rotation speed r/min, 20-60 shaft power N(KW), 50-80 efficiency %, vulcanized current matched motor and electric power. Crane truck: It is with 5 ton lifting capacity. Welding machine: 250A diesel power welding machine. Sets of tubular goodslike rotary tong, chain tong, different sized safety clamps, subs, manuals and fishing tools. Hand Tools And Equipmentlike hydraulic hammer wrench, set of crescent wrench, set of pipe wrench, hack saw, hammer, shovel & hoe, wire brush, water level. Dewatering Pumps, two Robin model 30HP, diesel powered engine with 50l/s pumping capacity. Supporting vehicles: One double pick Toyota cruiser and single cabin ISUZU pick will be deployed.